Destroyit Office Shredders are ideal for office and personal use. Our Office Shredders range includes Cross Cut, Strip Cut and DOD/NSA Approved High Security Shredders. The 0101 HDP Hard Drive Punch makes the Hard disks totally unusable once they are punched through it. Dimensions: 18.5" x 19.5" x 33.5"
The Destroyit 2604CC is a perfect Cross Cut centralized office paper shredder. The Destroyit 2604SC is an ideal Strip Cut shredder for centralized office environment. 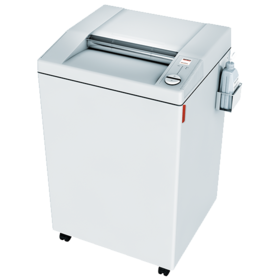 Destroyit 3104CC is a Cross Cut Paper Shredder designed for medium size offices. Destroyit 3104SC is a Strip Cut Paper Shredder Specially designed for laser documents. A strip cut office shredder for shredding confidential documents.